REA Forkin are very pleased to bring this charming detached house to the market. Ideally located on a a quiet cul de sac this modern home will appeal to first time buyers or those looking to trade down. The property has been very well maintained and is presented in very good condition. The gardens, mostly lawned, afford privacy and a large shed with its ow access is ideal for storage or indeed a hobby room if required. Both bedrooms are double and the living room / dining room is a lovely cosy room with open fireplace . The kitchen is well fitted and equipped and opens onto the sunny rear garden. The oil fired central heating system was recently upgraded. Rathnew offers a host of amenities including local shops, post office, leisure and sport facilities . 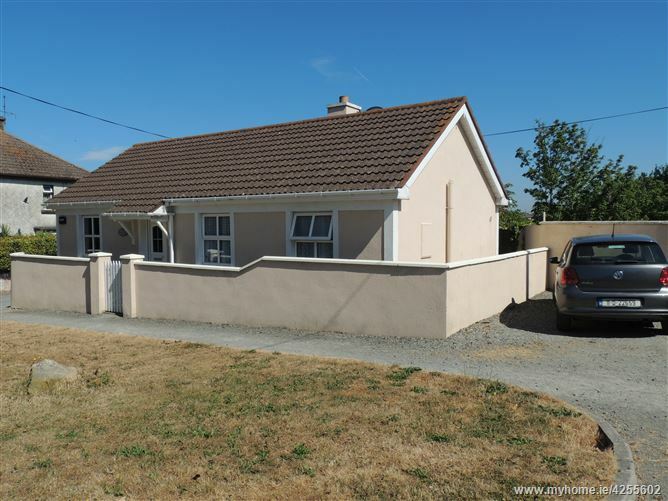 Wicklow Town is a short drive from this property with supermarkets, restaurants, harbour, library and train station. A regular bus route links Rathnew Village with Bray and Dublin City Centre. The N.11/M.11 is only minutes drive from the property for commuters travelling to South Dublin and the city centre. Open fire in cast iron inset and carved surround. Semi solid polished floor. Hotpress with dual immersion and heating controls. Tiled floor. Stainless steel sink and drainer. Tiled splashback. Plumbed for washing machine. Beko electric cooker. Power point fridge. Power Point freezer. Door to rear sunny rear garden. Bath with Triton T90sr over bath. W.c W.h.b. Heading south on N.11 take Junction 16, signposted Rathnew and Wicklow Town. Continue into Rathnew to roundabout. Take first exit and immediate right up the hill by the side of the shops. Follow the road around to the right and keep left at T junction. Take right turning just before Community Centre and Residents Cottage is the on the left hand side.